We departed Hilton Pond Center for the Charlotte NC airport on the morning of 6 November, scheduled to land later that day at San Jose for our first ever AUTUMN hummingbird banding expedition to Costa Rica. 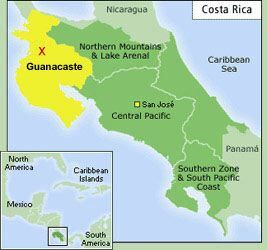 (Since 2004 we'd already led 11 successful mid-winter hummer trips to Guanacaste Province in on the country's Pacific Coast; see map below left.) With our group of citizen scientists due to arrive a week later we had hoped to get in some preliminary field work with our long-time tico guide and colleague Ernesto Carman Jr., but a devastating occurrence interfered and took precedence: 'Nesto's beautiful and talented 26-year-old wife Ela had been diagnosed with a brain tumor several weeks earlier and underwent cranial surgery to remove the cancer. Stalwart Ela came through the procedure very well, but follow-up visits to various medical professionals meant she and Ernesto were making near-daily 90-minute drives to and from clinics in San Jose--all in anticipation of radiation and chemotherapy due to start the end of November. We did manage to spend one day in the field banding Ruby-throated Hummingbirds--more about that in next week's installment--but for most of the week were content to offer moral support and wander around Finca Cristina, the organic shade-grown coffee farm near Paraíso where Ernesto and Ela live with his innovative and visionary parents, Ernie Carman and Linda Moyher. Camera-in-hand, we decided to rely solely upon our 100mm macro lens to get up-close views of flora and fauna that abound on the 30-acre farm. Everywhere we looked we found a display of exotic colors, shapes, and textures quite unlike those at Hilton Pond Center, the result being a collection of "Costa Rican Abstractions" we hope you'll enjoy. Although Finca Cristina is dedicated to raising highest-quality shade-grown organic coffee, half the farm is left in its natural state; thus, a vast assortment of organisms occur on the property. Among the most useful trees are wild bananas, Musa spp., that bear an interesting flower head (above) with numerous yellow blossoms. 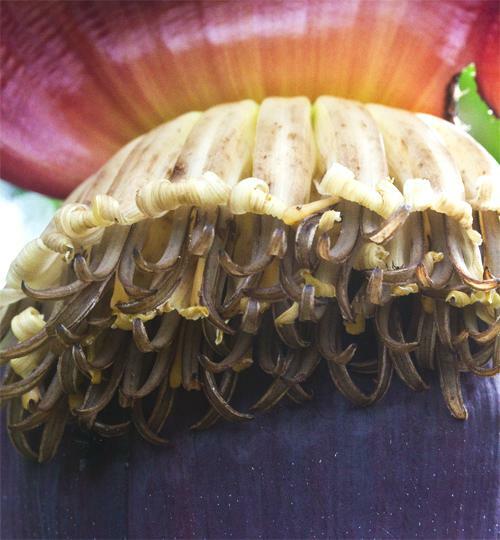 Those banana flowers are pollinated by a wide variety of insects from flies to wasps to butterflies--all made to feel at home by the finca's NON-use of insecticides and pesticides. The results are vigorous bunches of green bananas (above) that--when tree-ripened--please the palates of frugivorous birds, omnivorous squirrels, and hungry humans. Although we didn't find any Jackfruit, Artocarpus heterophyllus, right on Finca Cristina, this imported fruit tree is cultivated across Costa Rica's wetter areas as a nutritious source of dietary fiber. 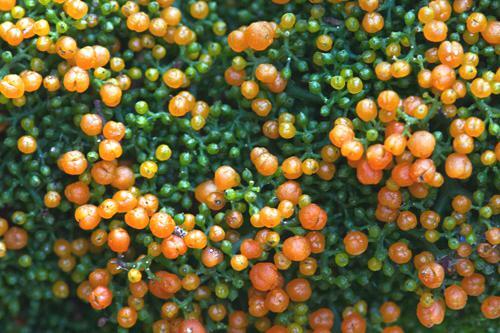 It's used as a meat substitute and as an ingredient in everything from chips to cakes and custard desserts. 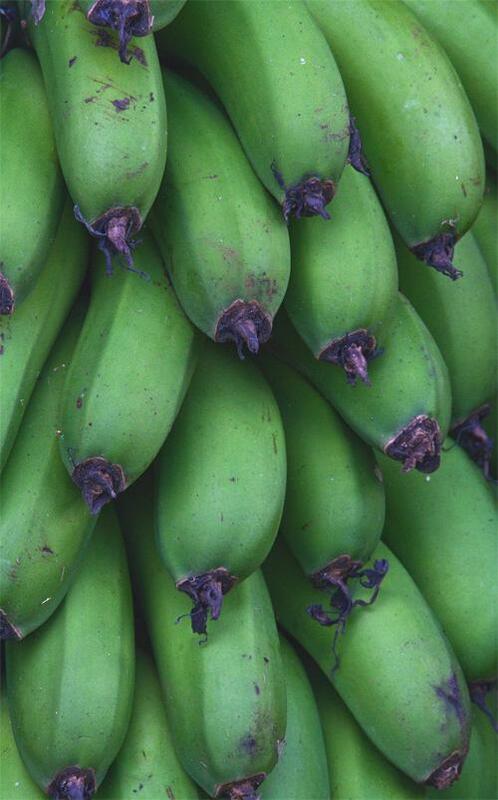 The massive fruit (above), which can weigh up to an incredible 90 pounds, is covered with quarter-inch tubercles reminiscent of that bunch of green bananas in the previous photo. 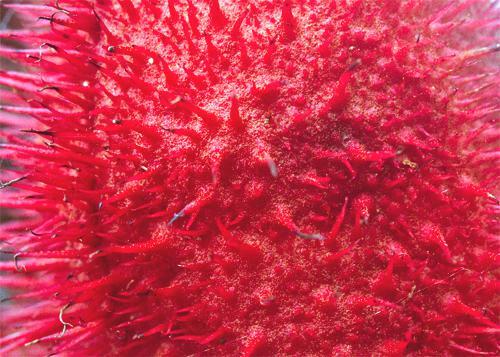 Achiote, Bixa orellana, is a large shrub that produces crimson pods (above) covered with soft spines. Inside the pod is a cluster of similarly red seeds containing a dense pigment used to color cheeses, margarine, rice, and other foods. Its subtle flavor is applied as a rub to enhance baked fish, chicken, and pork. Indigenous peoples used Achiote's bright pigment as body paint--hence the plant's alternate name of "Lipstick Tree." While we were photographing fruits and seeds at Finca Cristina, we could hardly pass up the chance to get an image of Coffee beans, Coffea arabica (above)--the farm's signature product. 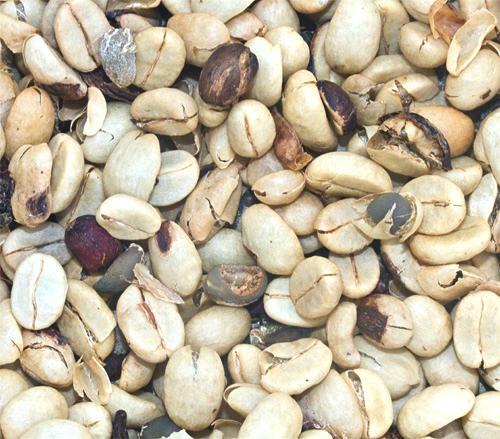 Stripped of the red skin and translucent pulp of the berry in which they formed, during sunny times of the year these beans are spread out to dry in the sun at the finca--thus avoiding the need for non-renewable fossil fuels to heat up drying drums typically used by big commercial coffee growers. Although Ernesto Carman Jr. transplants lots of native flora to enhance biodiversity at Finca Cristina, as an old coffee farm the place is still host to many species not native to Costa Rica. Among these is Shampoo Ginger (above), whose consonant scientific nameZingiber zerumbet would place it near the end of any alphabetical listing of local flora. 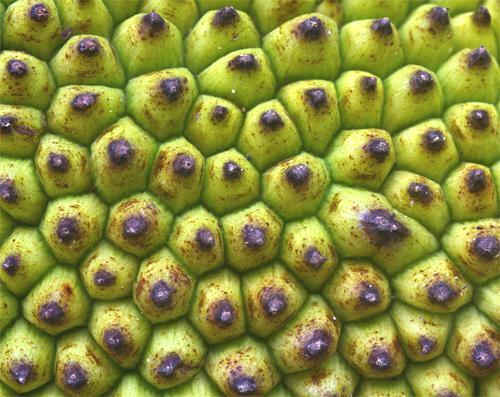 This plant, a native of the Indian Subcontinent, has cone-shaped flower heads with overlapping scales (above) that are slimy when mature. The juice is used as shampoo and body wash by indigenous peoples who also employ various plant parts for toothaches, indigestion, and flavor enhancements for meat dishes. 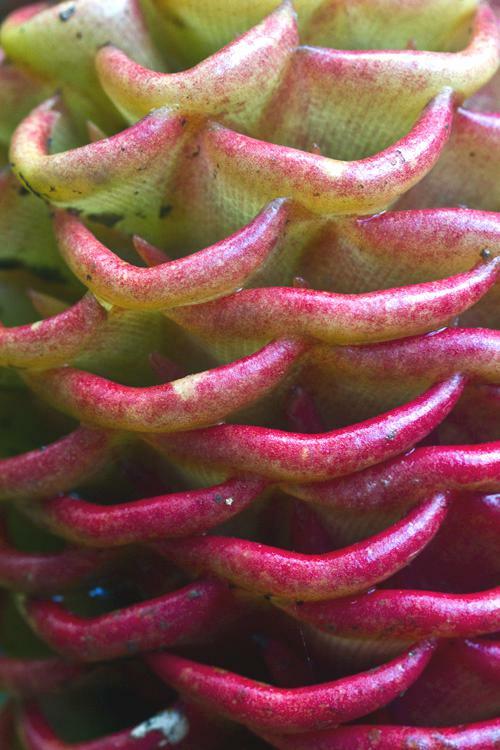 In a sun-dappled opening in the forest at finca Cristina we found a number of unidentified low-growing plants whose six-inch-tall unopened flower buds were covered by tightly overlapping brown scales reminiscent of the cones of evergreen trees. Native or ornamental? Costus sp. perhaps? We don't know. There are LOTS of fern varieties in Costa Rica--many more so than in temperate North America. Although some resemble species that grow around Hilton Pond Center, others have very different appearances--as is the case with the red-leafleted fern in the photo above. This is Blechnum proliferum--one of the Hammock Ferns--which can reproduce sexually via spores or vegetatively through tiny plantlets that develop at tips of its mature fronds. 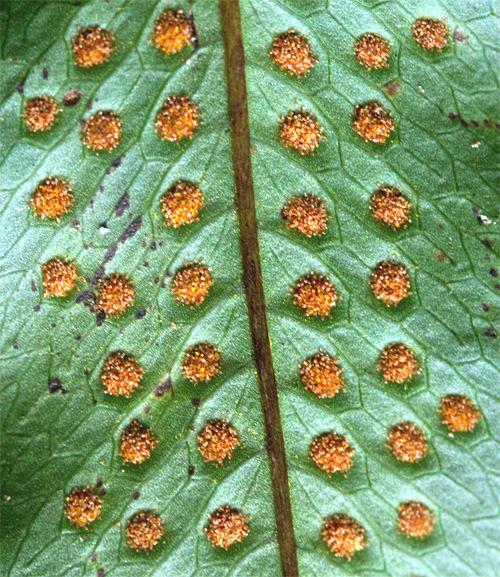 And speaking of sexual reproduction, leaflets on the unidentified fern in the photo above had multiple rows of sori--the structures that produce millions of nearly microscopic brown spores. Each sorus was less than one-sixteenth of an inch across. 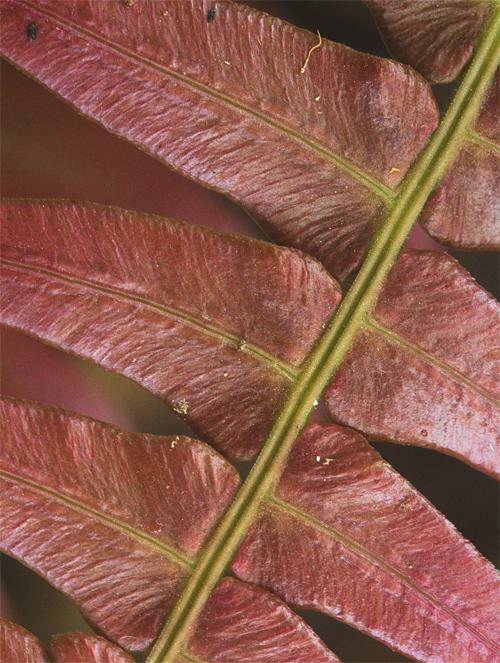 Costa Rican ferns are a marvel unto themselves, with some species so small as to be easily overlooked while big tree ferns have trunk-like stems and tower to heights of 65 feet. Although it may be a matter of perception rather than reality, it always seems to us North America--Hilton Pond Center included--is home to a much smaller percentage of plants whose leaves have parallel veins. 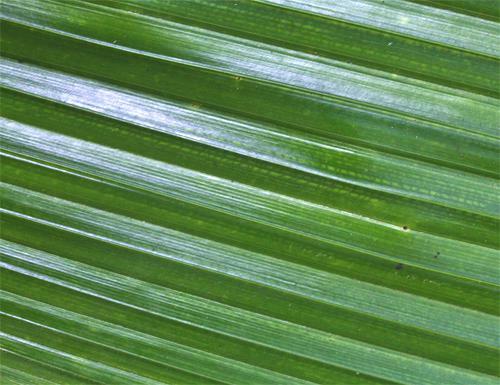 There's no doubt, however, that many tropical plants have much bigger leaves--including the unidentified one above that was three feet long and a foot wide. The leaf's parallel venation creates an eye-pleasing hill and valley effect that provides strength and increases surface area, allowing heavy rainfall to roll off the leaf surface without weighing down the super-sized foliage. In addition to heavy rainfall, tropical plants also must compete for available sunlight--a commodity made scarce on the forest floor by a dense tree canopy. Even the leaves of an individual plant must compete with each other. 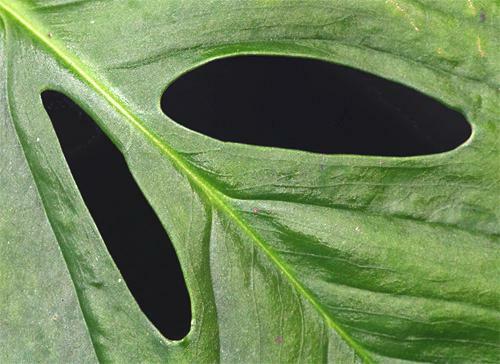 One way to avoid shading out your own foliage is to have a few naturally formed holes in your leaves, as demonstrated above by so-called Swiss Cheese Philodendron, Monstera obliqua. Variegated Coleus or Painted Nettle, Solenostemon scutellarioides, is another non-native plant that thrives in the moist, warm Caribbean slopes of Costa Rica. Imported from Southeast Asia, this species is seen in yards across the Neotropics just as in backyard gardens in North America. 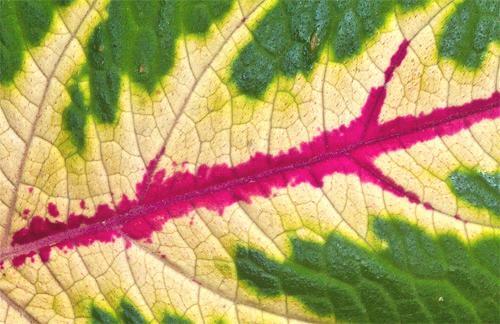 Only the green part of the leaf can photosynthesize, so botanists are undecided on the function of cells that have only red anthocyanins or no pigments at all. They may just be a functionless result of heavy hybridization. Numerous non-native trees are also now established in Costa Rica, among of the most noticeable being several species of Eucalyptus imported from Australia. Many older non-organic coffee plantations used tall Eucalyptus as shade trees, which didn't do much to improve habitat. 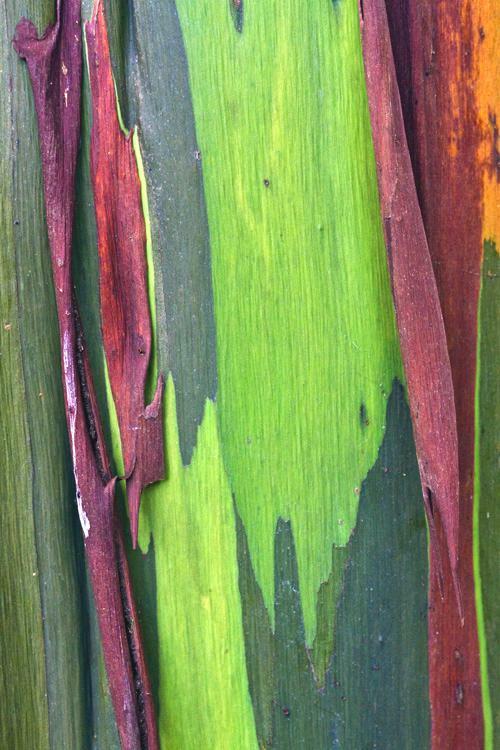 Imported Eucalyptus may have attractive abstract bark (above) but they deplete soil nutrients and provide little shelter or sustenance for Neotropical migrant birds. There are a few remnant Eucalyptus at Finca Cristina, but for the most part the farm's shade trees are native legumes that add nitrogen to the soil and provide microhabitats for ferns, bromeliads, and orchids. 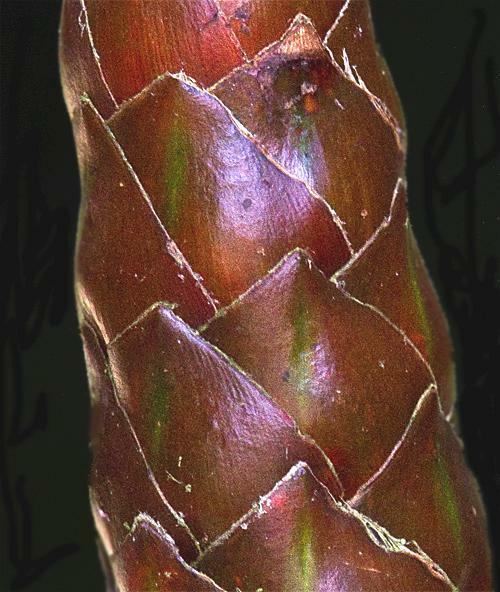 The Peach Palm, Bactris gasipaes, has bark armored with spines up to two inches long. This tree is especially valuable as a substitute for other rarer native species that have been nearly wiped out as sources of Heart of Palm. Peach Palm is also cultivated in Costa Rica for fruit that can be made into jelly and compote or eaten raw with salt or honey. Costa Rica is host to five species of native Cecropia. These fast-growing trees--up to five feet per year--are most famous for having hollow cores housing colonies of biting ants that attack potential herbivores that might otherwise eat the tree's foliage. 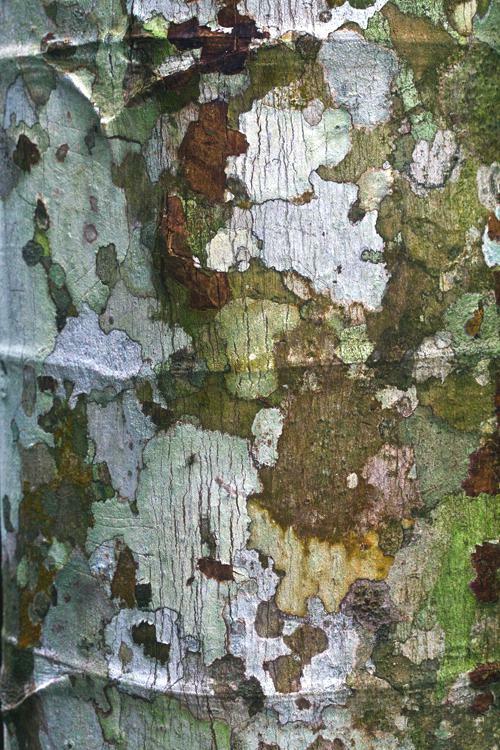 Cecropias have relatively smooth bark that in older specimens becomes covered by all sorts of colorful abstract lichens such as those pictured above. 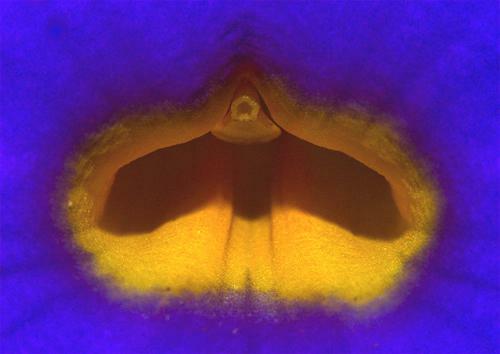 Growing in the herbaceous layer in the forest at Finca Cristina was an unidentified eye-popping flower whose blue petals with yellow center literally glowed in afternoon sun. We suspect the plant is an imported ornamental but don't know for sure. Among the most colorful blossoms in the Neotropics are the numerous species of Heliconia, whose reds and oranges and yellows (above) signal tasty nectar lies within. Heliconia blossoms are typically flat, deep, and structured such that only birds with appropriately shaped bills can get at the sweet reward. The White-tipped Sicklebill, for example, is a hummingbird with heavy decurved mandibles that fit a Heleconia perfectly but could never get inside tubular Trumpet Creeper flowers that are favorites of Ruby-throated Hummingbirds at Hilton Pond Center. The Heliconia above is H. rostrata, AKA Lobster Claw. Bromeliads are epiphytes that are ubiquitous in moist areas of Costa Rica, where they grow as "air plants" on trees, rock walls, and even telephone lines. Lacking true roots, they acquire nutrients from the atmosphere, from decaying bark, and from animal droppings. 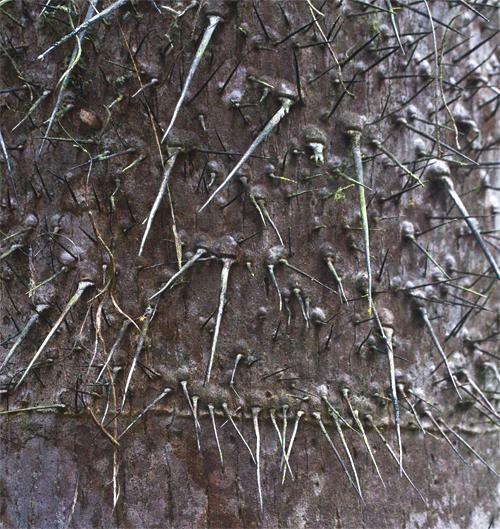 They are non-parasitic and cause no damage to host trees--except in cases where they are so prolific their combined weight causes a limb to fall. 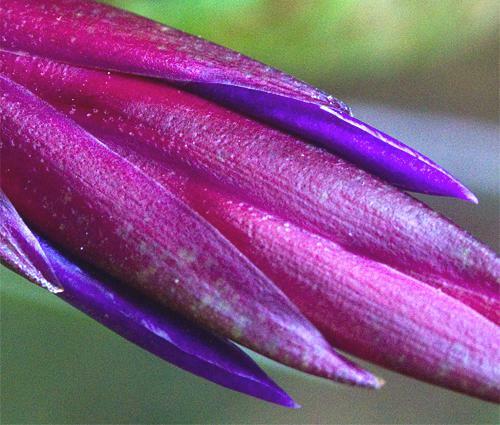 Bromeliads are known mostly by their thick, succulent leaves rather than by their distinctive and often colorful flowers like the purple one above, probably Vriesea incurva. With a plethora of plants--many of which produce nectar-laden flowers--Costa Rica is home to myriad butterflies and moths. Among the most conspicuous are the various Morphos, Morpho spp., of which the Menelaus Blue Morpho, M. menelaus, is perhaps most familiar. 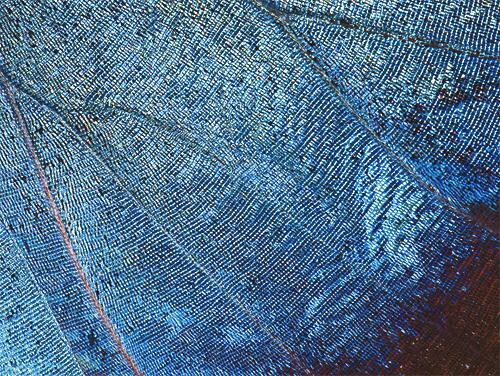 This Neotropical butterfly has wings covered with metallic scales of an indescribable blue hue (above) that literally flashes in the sunlight. Blue Morphos hang out in the forest canopy but sometimes come low enough for photos--especially after they become disoriented from drinking juice from fermented fruits. The antithesis of brilliantly colored Blue Morphos are nocturnal lepidopterans such as an unidentified Sphinx Moth (above) we found clinging tightly to a tree trunk early one morning. 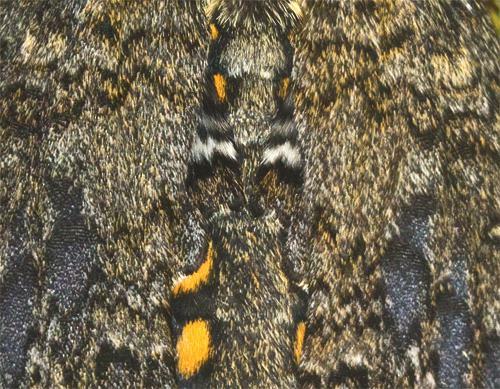 The cryptically colored moth with its mottled brown markings was nearly invisible against the same-colored bark of the tree. We made several checks over a six-hour period, during which the moth never moved. It undoubtedly was waiting for nightfall when it could fly with less chance of being detected--and eaten--by a potential predator. The plumage of many Costa Rican birds includes brilliant colors that make the birds more visible to prospective mates in the dark, shadowy rainforest. 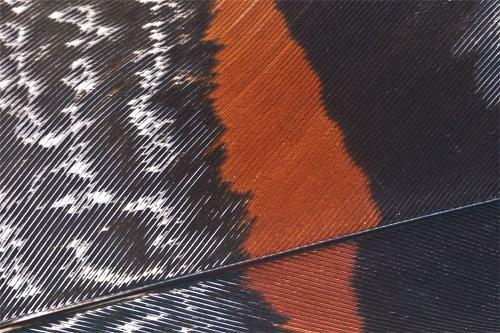 We have lots of images of these birds in situ, but it's not often we find a loose feather on which we can focus our macro lens. Thanks to Ernesto's wife Ela we were able to view an especially hard-to-get tail feather from a Sunbittern (above), with its contrasting white, black, and chestnut bars. Our only mild regret was that Ela didn't find one of the Sunbittern's primary wing feathers, which are even more colorful. Since we were in Costa Rica to observe and study hummingbirds, our final abstract image is the bejeweled throat (above) of a male Scintillant Hummingbird that fed on Lantana and Blue Porterweed nectar in the garden at Finca Cristina. This little hummer--scarcely half as big as Ruby-throated Hummingbirds we host at Hilton Pond Center--had a gorget bigger than that of a ruby-throat, with feathers at least as bright. 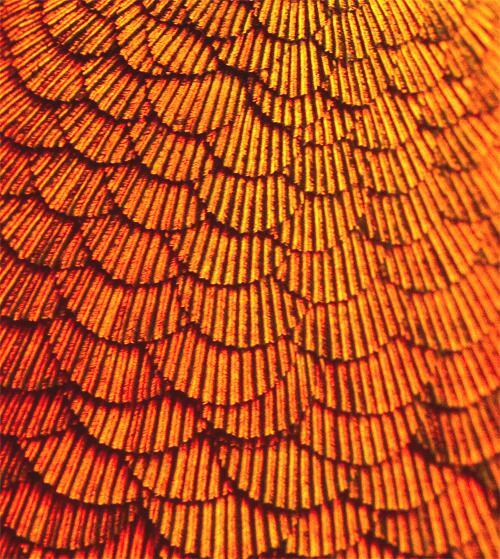 The Scintillant's scale-like throat feathers--devoid of red pigment--are grooved and contain tiny bubbles that scatter the light, bringing new meaning to the concept of iridescence. So there you have it, a sampling of our close-up photos of flora and fauna on or around Finca Cristina in Paraíso, Costa Rica. Although we always enjoy using our macro lens to capture abstract images of natural objects at Hilton Pond Center, the color, shape, and texture of plants and animals in the Neotropics surprises and pleases the senses in a way the more-familiar Carolina Piedmont has a hard time equaling. The Piedmont Naturalist, Volume 1 (1986)--long out-of-print--has been re-published by author Bill Hilton Jr. as an e-Book downloadable to read on your iPad, iPhone, Nook, Kindle, or desktop computer. Click on the image at left for information about ordering. All proceeds benefit education, research, and conservation work of Hilton Pond Center for Piedmont Natural History. --We took a four-day field trip to the South Carolina Coast in early November and departed immediately thereafter, leaving us no time for bird banding this week at Hilton Pond Center.